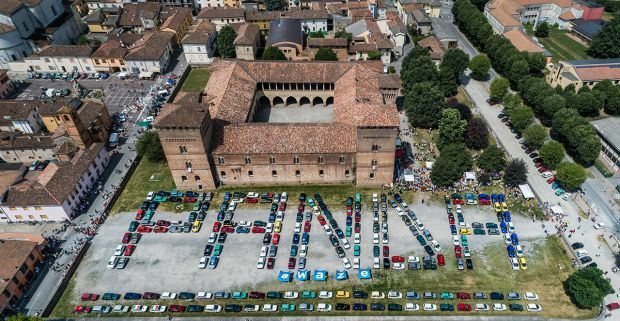 The colourful crew of Fiat Panda, counting many one-of-a-kind versions, met up in front of Pandino Castle and 200 cars spelled out the words “Panda Waze”. The second edition of “Panda a Pandino”, the international gathering of Panda owners from all across Europe – from Germany, Belgium, Spain, Italy, the UK and Austria – took place yesterday on June 24. In short, there is a Panda for everyone every day, for all nationalities and all ages, and 365 of them met up in Pandino breaking all records and making this the biggest Panda gathering in the world. Guest of honour of this second edition was the new Panda Waze, the most socially connected Panda ever, and rather aptly, one could say, since this event came into fruition on social media. The original idea started as little more than a joke in 2017 when a young Panda owner from the south of Italy announced on Facebook her intention to drive with her friends in their little car – popularly known as “Pandino” in Italian – to the town in the north of the country of the same name. And word of mouth, typical of the social media channels, saw to the rest. On 18 June 2017, the official date of the first edition, more than than 200 past and present Fiat Panda cars turned up, from all over Italy. The success of Fiat Panda is extraordinary in itself. The model has uniquely embodied a more spontaneous, carefree approach to everyday motoring ever since 1980. Remarkably, over 7.5 million have been made since it was first launched. Some of the proud participants to the event were special enough to receive one of the 11 prizes offered by the organisers. Prizes were given out to the best equipped Panda, the oldest Panda in show, the Panda that came from the further afield and the most extravagant Panda. Proceeds from “Panda a Pandino 2018″ Will be managed by Consulta dei Giovani, the entity organizing the event together with various associations and with the City of Pandino to restructure recreational spaces for families with disabled people. An impressive list of achievements reflected by equally impressive commercial success, for a model which, together with Fiat 500, has been Europe’s best-selling city car since 2003. The leadership confirmed also during the first four months of 2018, when Panda and Fiat 500 headed their segments in Europe with a market share of 29.1%,. The car is the resounding first first in Italy (with a market share of just under 40%) and Greece and in the first three places in Spain, Portugal and Austria.